The more we watch Star Trek, the more we find that (1) they are all clearly insane, and (2) we kind of like it. It must have to do with the sweet, sticky, pumping love that the Kirk-Spock-McCoy trio give off - they are just so cute! - and the "sci-fi for the insane" ideas. A testosterone-fueled Spock goes into heat? The Greco-Roman gods were aliens? Yet another planet of human beings reenacting yet another episode from 20th-century history?! It's all so perplexing and funny. Or, as Spockfield would say, FASCINATING. Anyway, we've been sucked in. 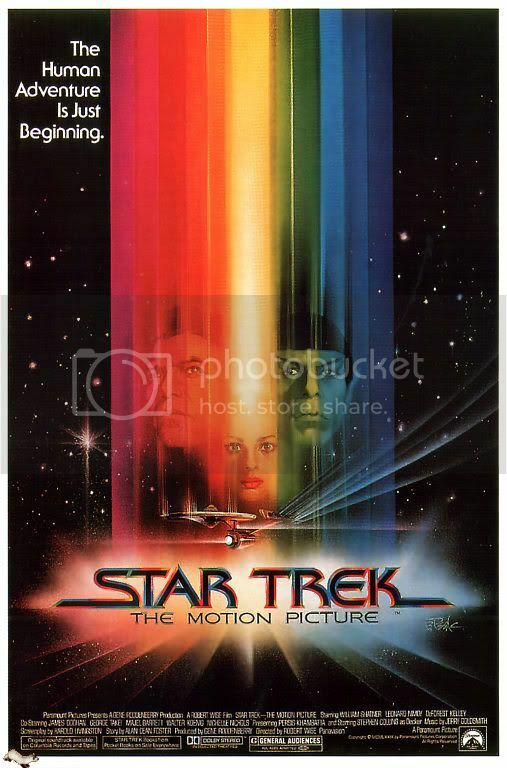 And after finding a moldy VHS copy of Star Trek: The Motion Picture at our local used media store, we just had to spring the two bucks and get it. After all, the last Star Trek movie we saw - Star Trek IV: The Revenge of the Humpback - was just too amazing. Well, we couldn't have found a more orthogonal movie to follow up with - it has none of the zany self-referential charm of the whale movie, nor does it have any of the demented wackiness of the old series. The vibe is completely different: lumbering, slow, melancholy, dystopian and sinister. It felt much more like that terrifying early 80s sci-fi movie with Sean Connery (which still gives us nightmares, by the way), or, as these guys rightly point out, like a Trekkified version of 2001: A Space Odyssey (another movie we found alternatively boring and creepy). Basically: everyone's wearing hideous white suits (with booties, oh Lord), there are a number of silent scenes where people just look at each other, and it all has this semi-mystical, semi-despairing "Spaaace, SPAAAACE" vibe. And in blue. Yay, McCoy's back (from Woodstock?)! 1. A mysterious energy field thing is floating through space, heading for Earth (oh no!). 2. The Enterprise crew get back together. 1. McCoy (DeForest Kelley) returns! Hooray, Dr. McCoy! McCoy McCoy McCoy! He may have nothing to do, but at least he's here! And then Spock (Leonard Nimoy) too! 3. A horrific (and gratuitous) accident happens with the beaming technology, thus adding a sprinkle of realism to the whole beaming thing. A nice, slightly cyberpunk-ish sci-fi touch, which terrified us (and explains McCoy's reluctance to use the beamer thing) but we appreciated. Act Two - when the Enterprise finally intercepts the mysterious floating energy cloud - becomes much, much more interesting. In fact, we shouldn't really tell you what happens, as the film goes to great pains to maintain a sense of mystery, slowly being revealed. The final scenes, when we get the answer to the puzzle, are pretty mind-blowing. It definitely blew our hair back! And all those gritty, hairy philosophical quandaries that make great sci-fi great are examined: what makes humans human, the nature of consciousness, Singularity/Arthur C. Clarke-type evolutionary jumps. All very interesting and fun. So our advice: skip the first hour. Nothing happens. It's poorly filmed. Instead, enjoy Act Two - which is some crazy stuff, man. In terms of general filmmaking, the direction is uniformly clunky and awkward, with bad timing and confusing cuts (the scene where Spock sends the message? Oy...). The acting is also a little shaky, as if a lot of the actors were just getting used to playing these characters again. While DeForest Kelley is still charmingly awful (what is it about his ability to be objectively terrible and yet so lovable? Sigh! ), the usually dependable William Shatner and Leonard Nimoy are strangely stiff and stilted. Similarly, the writing, while strong on philosophy (yay! 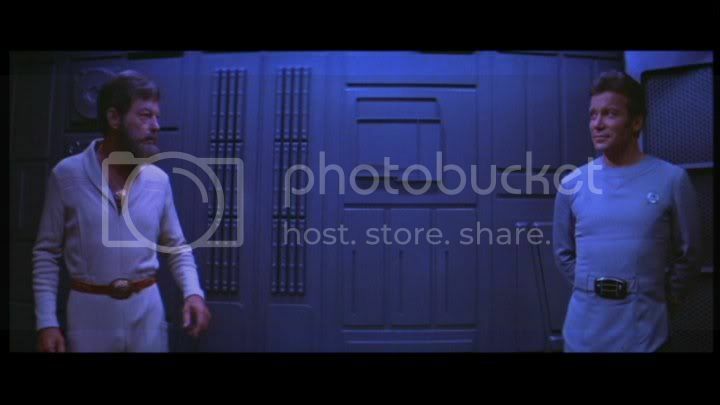 ), was a little bloodless on the whole fun Enterprise crew personality dynamic. That said, some bits were decent. The creepy, tragic love story between Commander Decker (Stephen Collins, the 1980s version of Aaron Eckhart) and alien lady Ilia (Persis Khambatta) waswell-played. The orchestral score and aesthetics were eerie and epic - very nice - especially the chunky analog look of the ships, and the post-psychedelic parabolic waves from the mystery ship. Groovy, man. A very slow start with a cataclysmic, fun finish - not great, but not as God-awful as the beginning implied. And now... bloopers! you guys are kind of motivation me to watch all the movies. I know I've seen some of them, but it's been years. And besides, I dedicated an hour after school in 9th grade to the original series, so I might as well dive in, right? OMG, when you said "terrifying early 80s sci-fi movie with Sean Connery," I thought you meant "Zardoz." I was off because that was 1974, but it's what I think when I hear "terrifying sci fi" and "Sean Connery" in the same sentence. Highly recommended for the utterly insane. Zardoz was my first thought as well (I can't find words to describe it) then after reading your comment I clicked and found out it was a film I never even heard of until now. Amey - I'm sure a lot of sci-fi ideas are inevitably recycled in a bunch of different places, which is why good characterizations and aesthetics can really make up for things! I loooved the Stargate movie, but never saw the series. Kelsy - Music to my ears! The movies are great, I've really fallen in love with them. Anarchivist - Ooh, and I had never heard of Zardoz. eliza bennet - Double trouble! Looks like I need to see Zardoz. Have you seen Firefly- the series? That was good. Star Trek was shown on PTV when we were kids and we used to call Shatner the-captain-who-falls-in-love, because invariably he would fall in love with a girl in every episode and she would be popped off/or sent to deepest space at the end of the episode. So the moment he "fell in love" you knew what was coming! Man was a "killer" in every sense of the word! 1. I am so glad you liked Star Trek IV. It is my absolute favorite. This might have predicted my fondness for Hindi films. 2. The first film sucked. The end. 3. Where the heck did you go??? bawa - Yes, I love Firefly! Though I think I preferred the film, Serenity, since I just don't dig the Western vibe of the series. Dude honestly, i too was bored for the same timeline that you quote. I like how you spill your beans.